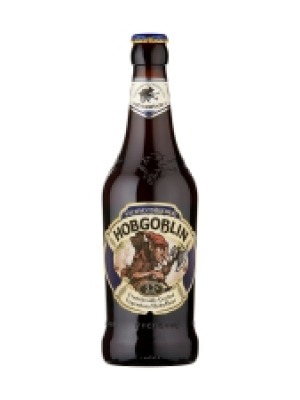 Wychwood Brewery Hobgoblin is a popular Ale available from Tesco Groceries in 50cl to buy online. Visit Tesco Groceries for the best price for 50cl of Wychwood Brewery Hobgoblin or compare prices on our other Ale products. Favoured by David Cameron and Barack Obama at the G20 Summit Hobgoblin uses the strap line "What's the matter Lager boy, afraid you might taste something?" emphasising its full bodied playful nature. Crimson red colouring with piney hop and dark marmalade scent give intriguing sweet malt flavours with mild syrupy textures. Where to buy Wychwood Brewery Hobgoblin ? Wychwood Brewery Hobgoblin Supermarkets & Stockists. You can buy Wychwood Brewery Hobgoblin online in most retailers and find it in the Ale aisle in supermarkets but we found the best deals online for Wychwood Brewery Hobgoblin in Tesco Groceries, DrinkSupermarket.com, and others. Compare the current price of Wychwood Brewery Hobgoblin in 50cl size in the table of offers below. Simply click on the button to order Wychwood Brewery Hobgoblin online now.